As editor of “Collegiate Baseball, The Voice of Amateur Baseball,” a periodical published in Tucson since 1958, Lou has worked in every facet of the newspaper since 1975 when he was a student at Amphitheater High School. Lou has covered the NCAA College World Series in Omaha, Neb., since 1975, missing only 1990 when his son Joey was born. He has written thousands of articles and taken thousands of photos during the tournament and has been the only journalist to cover the event as a writer and photographer. Pavlovich is the senior writer and photographer covering the College World Series. In addition, he has covered six Olympic Games for the baseball portion. In 1994, Lou received the Wilbur Snypp Award from the National College Baseball Writer Association and also is a past recipient of the Meritorious Service Award from the American Baseball Coaches Association for his many years of service to college baseball. 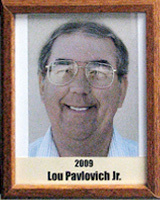 Lou graduated from Amphitheater High in 1976 and was editor of the Desert Gazette. He also worked as a sportswriter for the Tucson Citizen as a high school student.